When the Civil War began and President Lincoln called for volunteers in April 1861, Wisconsin’s volunteer militia companies answered the call. 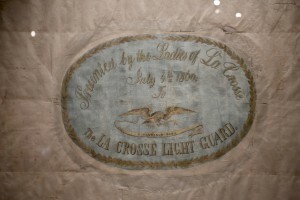 Among the first to offer their services to Wisconsin’s Governor Alexander Randall, the La Crosse Light Guard marched into Madison under a beautiful white silk flag made for them by the ladies of La Crosse and became Company B of the 2nd Wisconsin Infantry Regiment. On Tuesday, May 2, 2017, the Wisconsin Veterans Museum officially unveiled that very same flag in its new home on display in the Civil War Gallery. Through the generous donation of La Crosse’s American Legion Post 52, the Light Guard’s flag has once again returned to Madison 156 years later. 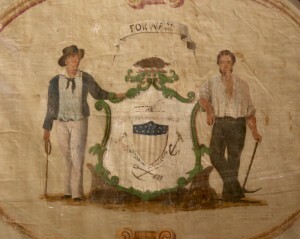 The seal painted on the reverse makes this one of the earliest known flags still in existence to bear the Seal of Wisconsin. 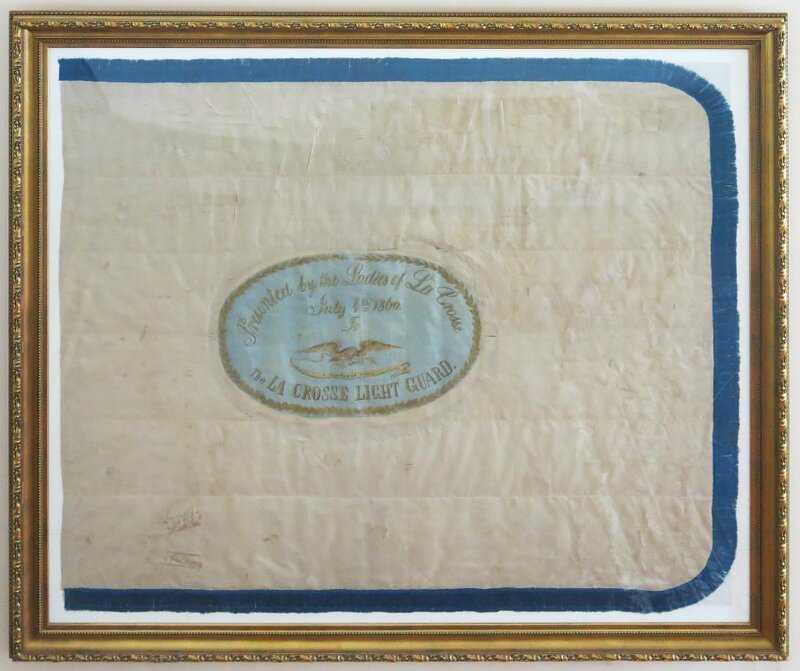 Reunited with the rest of its brethren in WVM’s Civil War battle flags collection, the Light Guard’s flag tells the story of the unifying of local and state identity. On the one side is the hand painted personalized dedication from the Ladies of La Crosse – a physical representation of the hometown love and support that those local companies marched off to war with. While on the other side, the flag bears a version of the 1851 Seal of Wisconsin – a symbol of the state that these militiamen volunteered to serve and defend. With the assistance of those that have cared for and preserved the flag over the last 150 years – especially the American Legion, the La Crosse County Historical Society, and Company B, 2nd Wisconsin Volunteer Infantry Association – this priceless piece of State history will forever stand as a voiceless witness to the deeds of those that answered their country’s call and served their state with the support of their families, friends, and communities back home so many years ago.